Flooding triggered downtown by Hurricane Sandy has prompted a town committee to take a closer look at its mission to create a strategy to help revitalize the town center. Specifically, members of the Downtown 2020 Committee are wondering if it remains feasible to seek $150,000 in study funds from both the town and private donors. "We've had recurring and historic flooding issues in the downtown area," Louis Gagliano, committee chairman, said at Tuesday's meeting, attributing much of the flooding problem to the "antique sewer system." "Doesn't the town have a responsibility to address infrastructure?" asked state Rep. Jonathan Steinberg, D-Westport. But the committee debated how much private money should go toward the effort, if any. DOWNTOWN FORUM The Downtown 2020 Committee will sponsor a forum on Tuesday, Nov. 27, at 7:30 p.m. in the Town Hall auditorium to update the community on the group's work so far to promote downtown revitalization and to hear public comments. "The committee wants to hear community ideas and thoughts for improving the downtown area," Louis Gagliano, the committee chairman, said in a statement. "In particular, we are interested in what other service offerings community members would like to see, their observations and thoughts about the recent flooding that has occurred," he said. "In addition, the committee would like to hear concerns about development projects and other changes that are likely to occur over the next several years." Questions about the forum can be sent to Gagliano at ljgags@aol.com. "We have been working for a long time on filling this gas tank," Gagliano said, referencing the $75,000 that the group hoped to raise from private contributions to match $75,000 it plans to request from the town. So far, $17,000 has been pledged, which Gagliano called a "luke-warm" show of support. "My feeling right now is we go to the town for the whole kit and caboodle," said committee member Robert Jacobs. "This is very important for the town ... and this is how the public gets involved." "You're shaping the future of Westport," he added. In particular, members expressed concern over the outdated drainage system downtown, which has periodically flooded during storms over the years. But during Sandy, a massive storm surge swamped the system and inundated many downtown businesses. "That drainage system is rotten on Main Street," Jacobs said. "The town knows that." 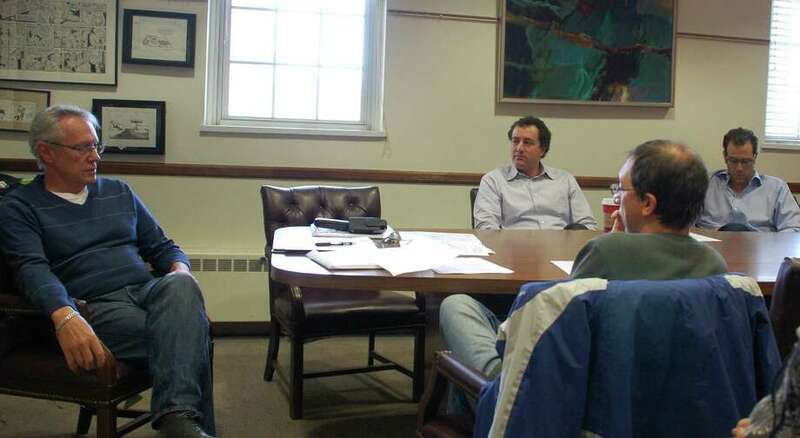 Several people present were critical of First Selectman Gordon Joseloff, who established the committee, and his administration's record on downtown issues. "Perhaps the town, or the current administration, doesn't appreciate the need for this to happen," said Paul Brandes, one of the principal developers in the Bedford Square project, which is proposed for the site of the Westport Weston Family Y.
Gagliano also pointed out later that Joseloff had not responded to the committee's written request to investigate the expansion of parking downtown. Committee member Daniel Kail suggested it might be worthwhile to use the $17,000 to have a consultant prepare a preliminary overview of downtown issues, and then that document could be used to help raise additional funds for a more detailed study. "There's a lot of money in Westport," he said. "It's just a question of creating the right presentation." He said people need to understand the sense of urgency in addressing infrastructure issues downtown, and also the dividends an upgrade would mean for businesses and the town. A forum will be sponsored Tuesday, Nov. 27, by the Downtown 2020 Committee to update the community on the group's work so far to promote downtown revitalization and to hear public comments. The event will take place at 7:30 p.m. in the Town Hall auditorium. "The committee wants to hear community ideas and thoughts for improving the downtown area," Louis Gagliano, the committee chairman, said in a statement. "In particular, we are interested in what other service offerings community members would like to see, their observations and thoughts about the recent flooding that has occurred," he said. "In addition, the committee would like to hear concerns about development projects and other changes that are likely to occur over the next several years." Questions about the forum can be sent to Gagliano at ljgags@aol.com.